When I was little, my grandpa drew a picture of a long-nosed, bald fellow looking over a wall. I said, “Who’s that, grandpa?” “It’s Kilroy, dear.” Then he wrote Kilroy Was Here under the drawing. After that, I started drawing the little guy all the time. Mostly, I was just fascinated by the drawing process and loved that I made a cute cartoon overlooking a wall. My curiosity wasn’t piqued enough to ask more questions or do more research. Again, I just thought it was a cute cartoon with a strange name. But lately I’ve been reading Niall Ferguson’s The War of the World, and Kilroy popped into my brain again. 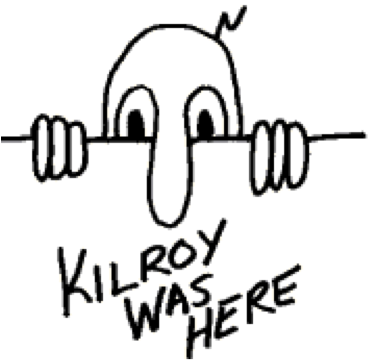 It dawned on me that Kilroy was more than just a cartoon, but what did he really represent? The story sounds plausible enough and is quite charming, on first glance. But let’s look at it further: “40 men stepped forward with stories stating that they were the Kilroy on which the legend was based. However, James Kilroy had the most compelling story.” James won because he had the most compelling story. It does not say that James was the original and true Kilroy – he just had the most compelling story. In fact, that very story has been altered – not greatly – but just enough to provide room for doubt. Apparently, the original story differed from the one reported in several key aspects. For one, James claims to have left the mark “Kilroy was here” as a middle finger to his bosses, who always made him repeat his inspections, thus wasting his time and energy. This was changed to say that the riveters themselves inspired James to leave the mark as a response to their sneaky ploys to pretend they did more work than they actually did. The significance should be obvious. 40 men stepped up claiming to be the original story. All were incentivized by the receipt of a sizeable prize – a 50-foot trolley car. James was in need of larger living quarters. Thus, he had great motive to win the contest. Now, that is not to say that he is not THE Kilroy. In fact, there may not even be a single originator. Notice how the story has changed in meaning? James Kilroy won the contest with his story of thumbing his nose at authority. The report changed it to James out-witting the workers who were trying to pull one over on the inspector. Now, we have an explanation of the slogan/cartoon as being a multi-national device put in place to warn soldiers of being watched. It seems this is much more than just a cute cartoon. “No place so remote that the U.S. military could not reach it” is both a morale booster and a creepy notion. On the one hand, knowing you’re not the first person to do something scary (like, say, attempt a jump off a tall bridge) might give you courage that you’ll survive. But, if the military is really everywhere, then there is the feeling that, truly, “You are being watched.” Another aspect of this to consider, however, is that it is obvious from the fecundity of the symbol that one person cannot be responsible for the entire dissemination. Thus, there must have been a sense of delight in being the first to write “Kilroy Was Here,” otherwise, the symbol would not have made its way to Mount Everest or the surface of the moon. Additionally, it had to have been a symbol of camaraderie - whether such brotherhood foments over a shared laugh or a shared sense of pain and fear matters less than the relationship-building itself. There are many more interesting analyses about Mr. Chad, Kilroy, Smokey Stover, and Mr. Foo (for a good discussion of Foo, see: https://tools.ietf.org/html/rfc3092). In the final analysis, Kilroy has several layers of meaning, and many individuals were involved. Likely, the meaning changed and evolved per individual and over time. The symbol seemed to fit whatever subconscious need was generated during and after a horrific war. What may have started as a worker’s chalk mark could easily have transmuted into They’re Watching You over the course of such a war. And what began as a symbol of and within the war could easily have become a cultural tattoo, stamped on the conscience of one generation, into one that spans several nations and several generations. I think the most valuable thing about Kilroy is that he’s something a grandfather can share with his granddaughter and she, in turn, will find out more about her grandpa and world history.